Happy Friday everyone! I hope you’ve all had lovely weeks. Do you have anything exciting planned for this weekend? I’m looking forward to a relatively quiet one, meeting with some friends here and there… the majority of it will be spent gazing at the new jewel on my finger (see here). Safe to say I’m obsessed. Speaking of obsessed, I have another interior fixation: pendants. I love the slightly industrial feel they bring and the contrast of the metallic finish against sparkling white kitchens. 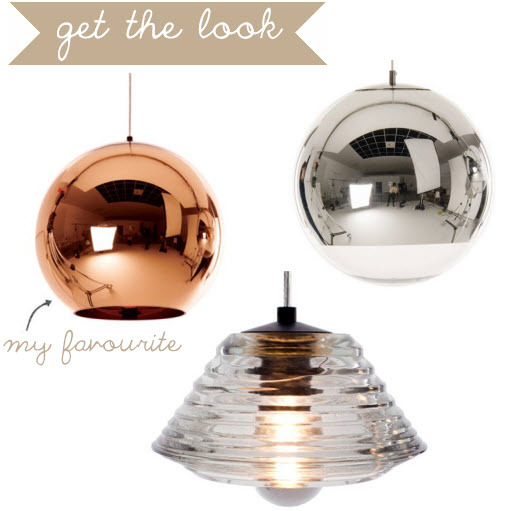 A kitchen island with copper pendants would be my absolute DREAM, especially if purchased from a certain Tom Dixon. Uh-may-zing. For my look of the week, I’ve gone for the Bombshell Du Jour, Amber Heard. I mean, seriously. She’s like ScarJo, but hotter. She wore a rose gold sequin Donna Karan to the 2012 Art of Elysium Heaven Gala, and other attendees didn’t even come close… and they included my red carpet faves, Bilson and Belle. It’s old Hollywood glamour done so well. As for my room of the week, the award goes to Michael Bublé’s bedroom. Be still my beating heart, check out the nailhead trim. That’s all.